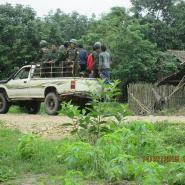 This Situation Update describes events occurring in Win Yay Township, Dooplaya District during the period between June and July 2015, including the relationship between Tatmadaw and civilians, the relationship between Karen National Liberation Army and civilians, education, healthcare, community situation, the relationship between Tatmadaw and Karen National Liberation Army and civilians’ business situation. Some local Karen villagers in Win Yay Township, Dooplaya District have lack of trust in KNLA because they feel that KNLA has not protected civilians since the preliminary ceasefire. According to some local villagers in Dawei Pauk village tract, Win Yay Township, some Burma/Myanmar government school teachers do not treat the students well if they cannot follow the lessons. Moreover, some children were told by their teachers not to go to the church on Sunday. There is limited improvement for local women In Win Yay Township, Dooplaya District because their limited education means that they were not chosen to be leaders. Most Karen people in Win Yay Township, Dooplaya District earn their living from cultivation, but after the [preliminary] ceasefire, many farms and gardens close to the Asian Highway road were damaged, causing a serious problem for farmers’ livelihoods. The following Situation Update was received by KHRG in September 2015. It was written by a community member in Dooplaya District who has been trained by KHRG to monitor human rights conditions. It is presented below translated exactly as originally written, save for minor edits for clarity and security. This report was received along with other information from Dooplaya District, including three other interviews and 123 photographs. 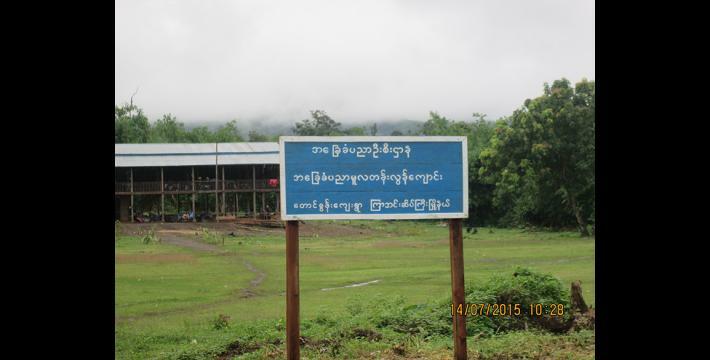 This Situation Update describes events happening in Win Yay Township, Dooplaya District between June 22nd, 2015 and July 18th, 2015, including the relationship between Tatmadaw and civilians, the relationship between Karen National Liberation Army [KNLA] and civilians, education, healthcare, community situation, the relationship between Tatmadaw and Karen National Liberation Army and civilians’ business situation. In Win Yay Township, Dooplaya District, Tatmadaw and civilians could make a good relationship and have good negotiations because Tatmadaw tried to help the local villagers as much as they could such as preparing food for a festival. If Tatmadaw soldiers said something wrong, some villagers dared to talk back to them because they [felt that they] understood Tatmadaw if Tatmadaw understood them [have a mutual understanding]. Some villagers said, “Tatmadaw are not [the same as] the previous Tatmadaw, because they are becoming so nice that they do not bite our hands even though we put our hands in their mouth”. In Win Yay Township, Dooplaya District, the relationship between KNLA and civilians is not very good compared to before. Some people said that local people’s trust in KNLA has faded away, but the local people tried to be nice to KLNA because KNLA are [also] Karen people. “In fact, we love our Karen people. There is a dramatic change after [the preliminary] ceasefire, but do they think Karen people are still on their mind [are KNLA still concerned about Karen people]?” said some villagers. Some people questioned “Are they eating each other [Karen oppressing Karen]? If KNLA still keeps oppressing Karen villagers, Karen people’s lives will never improve. Only educated people and exploiters’ [lives] will improve,” said one villager. In the meantime, the issue of yaba emerged. People who use yaba were arrested and they were punished in the area by KNLA’s base, but no one tried to arrest [or punish] the people who sell yaba. Although they [people who sell yaba] were arrested, they did not get any punishment. They had to promise not to sell yaba again, but they sell it again as usual by the time they get back to their villages. Some people still sell yaba in Dawei Pauk village tract, Lh K’Da village tract, Win Yay Township, Dooplaya District according to a responsible person [positon censored for security]. [Regarding villager security] One religious leader who does not want to be named said, “The place that we live is among Mon people’s villages. We have faced many challenges. During the rainy season, the area is covered with water. Sometimes we do not have any path to run away if something happens when Karen soldiers and Mon soldiers meet each other. 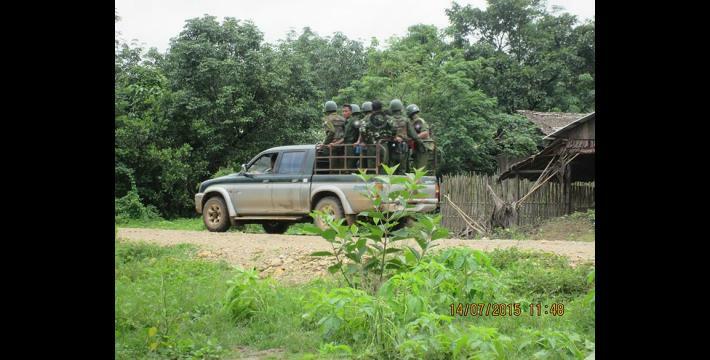 Last year, 2015, in the summer, 80 Mon soldiers brought many weapons and they arrived at [KNLA’s] Win Ka checkpoint in order to shoot KNLA soldiers, but Karen soldiers did not have any weapons in their hands. However, nothing happened. If Mon soldiers and KNLA soldiers had started firing, the people in our Karen villages would have been close to the death road because there were only one or two Karen soldiers [who could have protected them]. If something happens like that, the village head has to manage and organise the local villagers. The relationship between KNLA and civilians separates. Therefore, I want some [KNLA] leaders to take care of the village and check the village once per month.” Some local villagers also said that they want KNLA troops to take responsibility for their security and they should come to look after [the security of] the village once a month. The education system has changed dramatically, but it is [still] not perfect because there are many self-funded schools [where villagers must pay to establish their own school without Burma/Myanmar government support]. 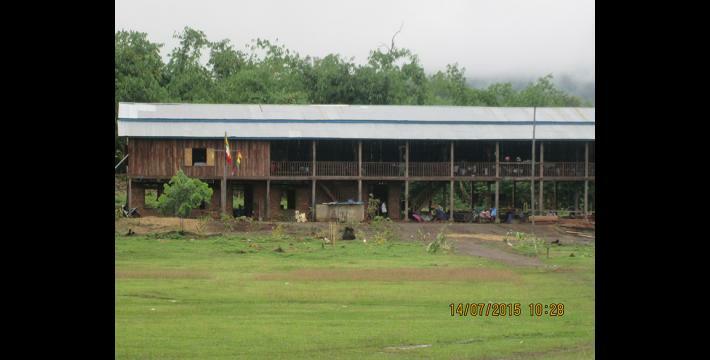 Also, some schools are in the Burma/Myanmar government’s name, but actually it was only the local villagers who built the schools with their own money [without Burma/Myanmar funding]. In some villages, Karen language is able to be taught for only one day a week, but in some villages, no one teaches Karen language [at all]. In some villages, some people said that some female Burmese teachers do not treat the students well if they cannot follow the lessons. Moreover, the children at the school from Dawei Pauk village tract were told [by their teacher] not to go to the church on Sunday. The education opportunity has changed from 2013 to 2015 after the [preliminary] ceasefire. No student has to pay to study at nursery school and primary school, but students have to pay if they are studying in the post-primary school. People who attended the teacher training also said that the whole village flooded during rainy season and also the transportation was bad. There are female Burma/Myanmar government teachers in the local village, but not enough. Therefore, people had to hire local teachers in almost every village. The local teachers who were hired had to teach the children from nursery school to middle school. Local villagers did not hire the local teachers at the high school, KNU supported them [by hiring local teachers]. The Burma/Myanmar government also supported the local teachers, but only a little. Even though the local teachers did not get much support from the Burma/Myanmar government, they were just getting by [managing to afford for their basic needs]. However, some village heads and female school teachers said that [Karen] people would be able to read and write and our country would develop if KNU and Burma/Myanmar government promoted education together. This information about education was collected in ten different villages, in Win Yay Township, Dooplaya District on April 25th and 29th, 2015. There was a difference from November 2013 to July 2015 regarding the healthcare situation [for villagers in Win Yay Township]. The difference is that an antimalarial group and local health workers came to the village and studied the situation of healthcare and then they checked the local villagers’ blood [for malaria] and gave the treatment. So they did not see any serious disease, but the only problem was villagers’ livelihoods. They [the villagers] just had a difficulty to struggle for their livelihoods because they did not have much money to go to the doctor if they got very seriously sick. Also, [for example] some villagers did not have a particular job to earn money, so that they had to go somewhere to sell their cows. When they were on the way with their cows, they had to cross many checkpoints. So they had to pay a lot of money as a tax. Although they paid money, the officer [from unknown group] at the checkpoint said their money [tax] was not enough. Those checkpoints are related to many armed groups including Burma/Myanmar army group [Tatmadaw] and located in Win Yay Township, Dooplaya District. There were some changes in Win Yay Township, Dooplaya District regarding the community situation from June 25th 2015 to July 18th 2015 because KNU’s township administrator in Win Yay [Township] gave administration training to village tract leaders and then he organised KYO [Karen Youth Organisation], KWO [Karen Women Organisation], FFSS [Free Funeral Service Society] including KWEG [Karen Women Empowerment Group]. By looking at these activities, it is obvious that the community situation was making some progress, but the civilians do not totally trust KNU in their hearts because people always doubt whether they should trust the [preliminary] ceasefire agreement or whether they should be ready to flee [because fighting might break out again]. However, it is still happening that men mostly get higher [leadership] positions in the village and they keep women away. Some villagers said it is because Township leaders do not show [develop] any rule or law for discrimination but also, they do not try to coordinate [ways] to cooperate with women. Some people in A--- [Town] also said, “The sun does not rise if the hen crows,” [meaning that women cannot be strong leaders]. Some women are not chosen to be a leader because they are not educated. Some women are chosen to be a leader, but they resign from the position after one year. Some villagers said that KNU should make a long-term higher position for women otherwise, there will be no improvements in the village. The situation of Burma/Myanmar Army [Tatmadaw] and KNU was still normal from June 23rd 2015 to July 18th 2015 in Win Yay Township, Dooplaya District. One village head said there is no problem for armed groups, but there are more and more challenges for the civilians. After [the preliminary] ceasefire, Burma/Myanmar army [Tatmadaw] group do not call the villagers for portering and forced labour, but they just ask the village head politely to help them [find villagers for portering and labour] because they said their soldiers have run away as deserters. On the July 9th , Battalion Deputy Commander Ye Min Hein from LIB [Light Infantry Battalion] #555 asked the village head to temporarily rent him two cars. Then, Saw A---, the village head, again went to ask the villagers to provide two cars. In the village, there are only two cars which belong to the villagers and Sayar B---. Actually, the villagers did not want to help [provide cars for LIB #555], but they worried that their village head would be in trouble if he could not help Battalion Deputy Commander Ye Min Hein. Also, he [Battalion Deputy Commander Ye Min Hein] only put five gallons of the petrol into these two cars [instead of paying the villagers rent money]. He did not have any money for rent. On July 10th, 2015, he [Battalion Deputy Commander Ye Min Hein] took two cars to pick up Operations Commander Tin Tun from Kho Khan [stream] and he had to send Operations Commander Tin Tun to Me Th’Li Chaung [stream]. On July 14th 2015, again, he had to pick up Operations Commander Tin Tun from Me Th’Li [stream]. The car owner and Sayar B--- said it is 10 miles far away from Kho Khan [stream] to Me Th’Li [stream]. Currently, the Burma [Tatmadaw] army leaders who stay in Lay Naung army camp are Battalion Deputy Commander Ye Min Hein, Camp Commander Hein Tat, Commander Hein Lat, Commander Myo Ko and Commander Zaw Po Oo. This is the type of relationship that they [Tatmadaw] have made with the civilians in an amicable way [not demanding but still requesting things] after the [preliminary] ceasefire. Some people said it would be fine if KNLA talked about it [negotiated with Tatmadaw] for the civilians, otherwise the civilians’ lives will never get better. Just look at the Asian Highway road. The civilians do not feel confident to hold a demonstration on the road. KNLA and local Karen armed groups said the people [protestors] could not walk along the road if they hold a demonstration. Burma/Myanmar government military groups have never said that they could not walk on the road if they hold a demonstration. So many civilians have doubts regarding the ceasefire, asking if it is [a benefit] for the people or [only a benefit for] KNLA. They [the civilians] said they just want to ask questions like that after looking at the situation which is happening right now. The civilians [in Kawkareik Town] questioned, “Can we get our land [which was destroyed by Asian Highway construction] back? The words ‘Karen National Security’ are written [and spoken], in fact, do they [KNLA] protect the people? If they do protect, what do they protect?” People want to know about that. Now the people only get the land by [small] portions beside the Asian Highway road, but KNLA leaders who are rich buy lands without consulting local villagers. Local villagers want KNU to see their tears and hear their voices [to be aware of their struggles] when KNLA and Burma/Myanmar government military group work together. People also want KNU to see the situation that people are suffering and starving because people look like a man running without hope [trying hard but not succeeding]. According to one villager who lives in C--- village, no one dares to help villagers make a land title if KNU leaders do not permit it. We [villagers] have paid taxes on our land to the KNU for many generations, but now we do not know what the KNU will do, during the current political transition. This [villager] is just showing some dissent between KNU and some civilians. In 2013, Battalion Commander from Battalion #16 [KNLA] held a meeting at Lut checkpoint and afterward he told the village heads that they had to record everything that had been destroyed and damaged due to the Asian Highway road because that is very important for civilians. Finally, Battalion Commander Tin Laing from Battalion #16 asked the village heads, “Why are the villagers not happy? We are building better roads and they should be happy [about this]”. One village head dared not to say anything more to the Battalion Commander. No villager dares to open their mouth [to criticise] up to now. Even though DKBA [Democratic Karen Benevolent Army] exists in Win Yay Township, Dooplaya District, they just base their army camps at Three Pagodas Pass [Town] and Chaung Hso [Town]. This group [DKBA] acts normally and peacefully in this area. 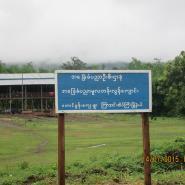 Some people said it would be benefit the villagers and local organisations if DKBA and KNU work together. However, as long as drugs and gambling exist at Three Pagoda Pass, the young generation will become useless [dependant on drugs and gambling]. Burma/Myanmar government military groups [Tatmadaw] said that they will take action against people selling drugs and gambling, but this is only words [not actions]. They just ignored all of the issues related to the drugs and gambling. Related to drugs, some community members reported that drugs are notorious [very popular] among people, but no one dares to talk about it because people who talk bad things [criticise] about it will not survive for a long time. They wonder if it [drugs issue] is related to the organisations [powerful actors]. The situation of civilians in Win Yay Township, Dooplaya District is improving. Some people have enough money to build their own mobile phone shops and do business (buying and selling) and also they work in their gardens. For the people who do not have money to invest, they just have to work as a daily labourer. Most labourers just earn 4,000 kyat per day [US $2.94] , but some people do not get that much. However, nothing is improving for the working class [daily labourers]. The [rich] people who live in other towns can find money when they come and stay in Win Yay Township. 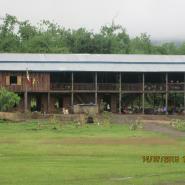 Most Karen people earn their living from cultivation, but after the [preliminary] ceasefire, many farms and gardens which were close to the Asian Highway road were damaged or spoiled. Some parts of the land were farmlands which belong to some people, some parts of the land were garden lands. So, they [villagers] lost their lands and it became a serious problem for them to support their livelihoods. Therefore, the local villagers who lost their lands tried to get back their lands in their own ways; consequently, they were called by the local KNU official after KNU found it out and also, they were interrogated. Because of that, some local people stopped trying to get back their lands and some people just let it go. A lot of local villagers suffered because their lands were taken away, but the people who own company trucks, line [taxi] cars and checkpoints get a lot of benefit from the Asian Highway road. It is easy to travel for the local civilians and armed groups. [In another business incident] the people who own some business companies threatened the local villagers because on May 5th, 2015, a local KNLA officer, Saw C--- and [the coordinator who takes charge of the Asian Highway road] Saw D--- talked to the local people who live near Asian Highway road in a meeting about the right to deny and the right to forbid if the [road construction] company does not work in the correct way [breaks the law]. Because of this, the local villagers forbade the company to take out stone from the local stream, but on May 6th, 2015 U San Lwin [the road constructor] said to the villagers, “Who do you think you are? Do you think you can stop it? We are the government.” The secretary from C---s village said, “Don’t walk on the Asian Highway road if the road is closed like this [for construction].” The villagers were also told that it is worthless to build the road for them [because they keep complaining]. Thus, the Asian Highway road has created many problems and challenges for the people in Win Yay Township. When the local people protested, they were interrogated and arrested. When they tried to ask for their lands [back], they were called and scolded by the road constructor. This road was once named “Death road” [because of the slave labour and harsh conditions for labourers during its initial construction under conflict], but now it is called Asian Highway road. The local people complained that the local village has not been improved and developed since this road was built. Furthermore, no one knows about how many lands were lost or destroyed except the local people. The local villagers were asked to work as stoneworkers, but these stones were not purchased. [They were] also [asked to work] as loggers. Previously KNLA, Tatmadaw, the [local] forestry administrator, transportation administrator and private companies gave permission to do logging and stonework to the local villagers in order for them to get work and earn a living. If one stone pit [hole] costs 18,000 kyat [US $13.24], the company manager and director said they would buy it, but now no one is involved [to help villagers] and no one wants to help sell it. They [the company manager and director] said they definitely would buy it because that is what local Karen armed groups had guaranteed [said] to local villagers. “The investment [by the company in stone mining] is 280,000 kyat [US $205.97]. If they [the company] do not buy the stone after local villagers have dug and made one hole of stone, local people would be in debt. It also affects local people’s business. If some village heads took a stand for the civilians regarding the Asian Highway road, one year later they would lose their jobs. This [problem] is because the civilians just talked about their opinions and perspectives. In fact, they dared not to say anything on the ground [to the authorities],” said one villager. In Win Yay Township, Dooplaya District, although school tax has decreased, there are not enough school teachers. Karen language is not being taught in the school time, but outside of school hours. In some villages, teachers teach [Karen language] one day per week, but only for one period per day. The [Burma/Myanmar] government gave little assistance to some self-reliant schools, but the government still claimed that those self-reliant schools became [Burma/Myanmar] government schools. The local people work hard as education has become the first priority for them. Regarding the healthcare, it is easy to travel in the summer. During the summer, an antimalarial group went around the village and checked the health condition of the local villagers. Also, a committee on the rule-of-law, named “Law Ka A’Lin” [the universal light] which is related to NGO activity came to the village and educated the villagers. Regarding the community [social] situation, it is now different from the past. People do not discriminate against each other due to race and religion. Their relationship gets better. Regarding the business situation, nothing has changed regarding local community improvement because they do not have any right to do anything. If local people start to work on something, they have to pay tax first. Besides, no one helps the local people if any problem arises. The village head does not listen to the civilians or care about the civilians’ suffering. Poor children get ignored and rich families get looked after. It means they [village heads] do not rely on local villagers, but they just look at organisations and business companies [for guidance]. The name [for KNLA] is “Karen Security Force”, but Karen people have not felt secure for sixty-five years. Before talking about [criticising] other people’s weak points now, it is more suitable to talk about other people’s weak points when every organisations’ weak point can be fixed. Tatmadaw know about these voices [criticisms]. The people are suffering but Karen people have their own Karen government [KNU]. We [civilians] do not get involved. They [KNU] work for their people. If the Karen government [KNU] does nothing for Karen people, I see that it is impossible that the Burma/Myanmar government would do something for Karen people. Therefore, the Karen national army [KNLA] and Karen security checkpoints should be good examples [of their work with Karen people]. Their words must be their bonds [promises] because Karen people and KNLA are very close and can build a good relationship. If so, the Karen army will be backed up [by civilians]. 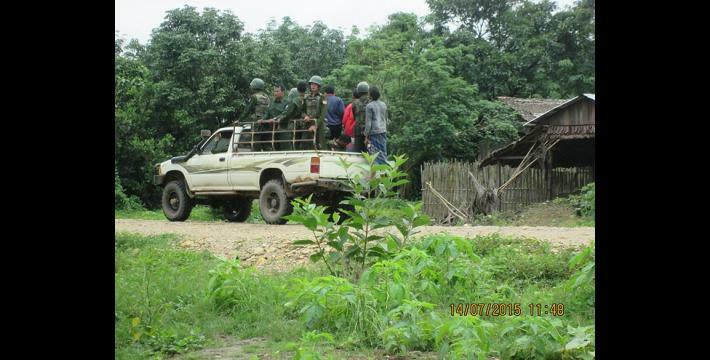 Now the situation has become that Karen people are afraid of Karen army [KNLA]. I want to conclude that Karen leaders should consider and open up opportunities and ways for Karen people and the Karen army [KNLA], this will make them become more like a family. The Asian Highway Network is a United Nations Economic and Social Council for Asia and the Pacific-supported project that aims to link 32 countries in Asia across 141,000 kilometres of roadway. In Burma/Myanmar the project has involved land confiscation and forced labour. For more information about the Asian Highway Network, see “Beautiful Words, Ugly Actions: The Asian Highway in Karen State, Burma”, KHRG, August 2016; “The Asia Highway: Planned Eindu to Kawkareik Town road construction threatens villagers’ livelihoods,” KHRG, March 2015; “‘With only our voices, what can we do?’: Land confiscation and local response in southeast Myanmar,” KHRG, June 2015; “Tollgates upon tollgates: En route with extortion along the Asian Highway,” KHRG, October 2009; and “Development by Decree: The politics of poverty and control in Karen State,” KHRG, April 2007. 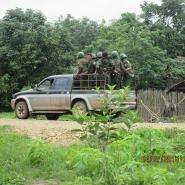 In addition, fighting continues erupting between the Tatmadaw and the DKBA along the highway, with the latest clash erupting in early July 2015, resulting in the highway between Myawaddy and Kawkareik shutting down for several days, “DKBA, Tatmadaw fight over illegal highway tolls,” Myanmar Times, July 3rd 2015. Sayar (male) or sayarma (female) is a Burmese term used for any teacher, pastor, or any person to whom one wishes to show respect. During the late 1990s and 2000s many villagers in Karen State experienced relentless demands for forced labour from Tatmadaw. Many of those forced labour demands were to construct roads used only for Tatmadaw military vehicles, and for Tatmadaw to access further areas of Karen State and re-supply their troops more rapidly. Requesting a land title for formal land registration is a common strategy by villagers to protect themselves against land confiscation. For more information see Section III, “With only our voices, what can we do?’: Land confiscation and local response in southeast Myanmar,” June 2015. See, for example the case of a 62 year old villager from Htoh Kaw Koh village tract, T'Nay Hsah Township, Hpa-an District who was murdered in March 2013 for telling BGF Battalion’s #106 soldiers that she disagreed with their drug selling, “Hpa-an Situation Update, T’Nay Hsah Township, March to May 2013,” August 2013. All conversion estimates for the kyat in this report are based on the 3rd March 2017 official market rate of 1359 kyat to US $1.